Spotlight Musical Theatre, located in the heart of Mt. Airy, provides kids of all ages quality musical theatre training and allows children to explore their own sense of identity and self confidence. Spotlight focuses on individual growth and provides students a safe, professional setting to overcome their personal obstacles. It’s here where students are given the tools they need to create a role and perform it live on stage in front of an audience. SPOTLIGHT IS MORE THAN JUST A MUSICAL THEATRE SHOW, IT’S AN EXPERIENCE! 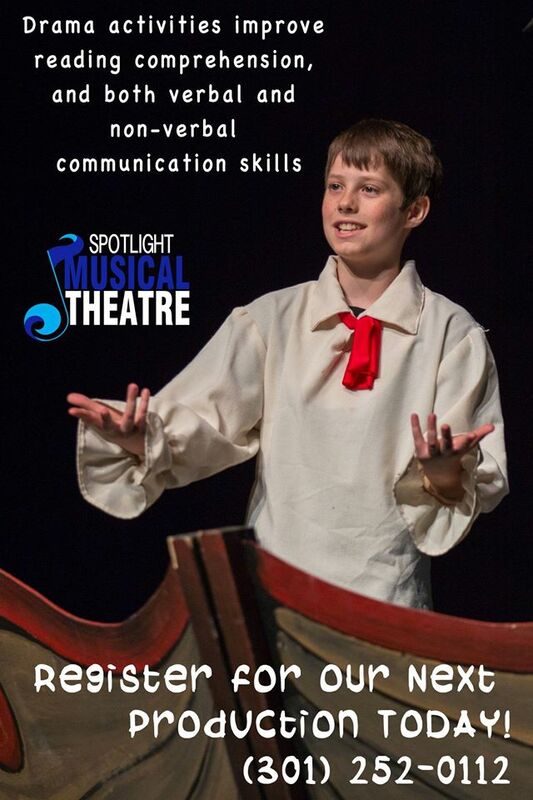 Spotlight Musical Theatre is specifically designed to guide artists of all ages, thru performing arts training. Our directors teach the fundamentals of acting, singing, and dancing during the 3 Month program while providing students with personal experiences and insight about the professional industry. ANY LEVEL OF EXPERIENCE IS WELCOME! Register today for the next Spotlight Musicals Mt Airy program by Clicking Here. Questions? Call us at (301) 252-0112. Looking for a Childrens Theatre company in Damascus, Green Valley, Eldersburg, Frederick, Montgomery Village, Germantown, Redland, Olney, Westminster, Gaithersburg, Reisterstown, Randallstown, Columbia, Rockville, or Owings Mills? Give us a call and join Spotlight Musical Theatre!